New Business. New Website. New Haircut. New Everything! This is fun... Starting a company. It's fun. Coming up with a name & developing a business plan... Fun. Even the monotony of applying for a business license & getting a UBI number, getting a Federal Tax ID number, and getting licensed to run a business in the city of Seattle doesn't bother me in the least. Coming up with a name proved to be a time-consuming affair. It took a lot of time in dictionaries & thesauruses and checking online to see which domains were available. As it turned out, my top ideas for business names were already taken in one form or another. After a couple days of coming up with ideas & running them across friends, I finally realized that the process could go on for days or even weeks & I had to decide on something & move on. Finally I settled on PIXELtechnics. I'm stoked about it & I think it works well. I like how it's a play on pyrotechnics & I can create a new term out of it, the definition for which is on the home page of my site. Ultimately, I will be coming up with other trade names/brands to operate under as time progresses & we start producing content geared towards different demographics. Developing a website, Facebook page, new email account & getting them to work in cohesion with each other, my Vimeo page & this blog has been a interesting endeavor as well. It's fascinating seeing how all those faces of the company work together... I also have to mention how much I've been loving Squarespace for how fun & simple their service is & how awesome their Support Team is. I quickly became loyal to them & recommend them to anybody looking to build a simple but dapper site. Last night I went to my first Sounders FC match & it was so dope! Since some of my European friends got me to watch the Euro Cup in '08, I'm slowly becoming more & more of a soccer fan after 20+ years of not caring about the sport at all. So, in light of this & last night's 2-0 Sounders victory, I'm gonna take a break from blabbing about my own work & focus on some work I've been admiring as of late. Next is a video I'd actually mentioned in a previous post. French phenom director Romain Gavras came out with this one early last year. Like most of the work I've seen from him, it packs a punch & gets you amped! The music, choice of shots, quick cuts & amplified real audio make me want to buy Adidas gear & brawl with the Green Street Hooligans. Lastly, I wanted to showcase a piece that came out of Germany a few months ago... I once heard a song by NAS where he told a story in reverse. Though my appreciation for rap music's been crumbling since the early 2000's, the creativity of that song astounded me. It's such a simple concept, but it was so awesome... I've wanted to see a story told using that same narrative structure on film. Though I'm not saying it's never been done before ("Momento" was similar), this is the first time I'd seen it, and it really excites me. Side note, it's funny how good video advertising has been increasingly appealing to me lately. I think it just speaks to the direction I'm heading in life. 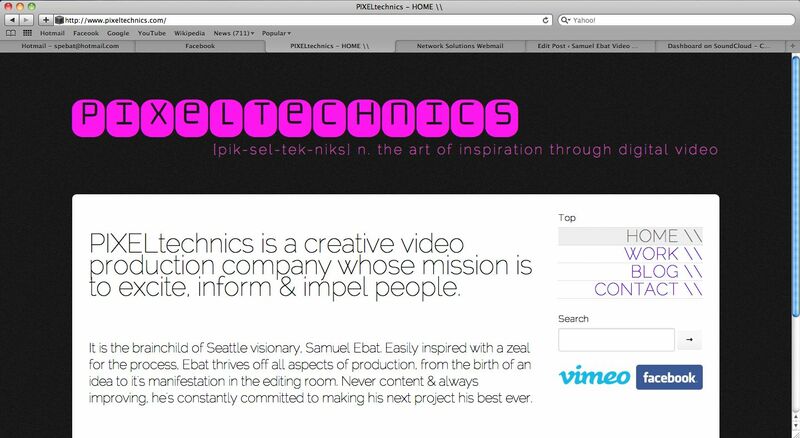 I sit & analyze how & why certain commercial video content is effective & I become a fan of the people who produce it. It's a lot like how many people are with feature films (myself still included). So now, in addition to watching the Oscars, I'll also be following what goes down at the Clio's... Ha! The Story Behind "(270) Seconds of Summer"
Many of those editing hours were spent experimenting. For example, the tracking text on the animals took a day to learn & another day to implement. Creating the split-screen intro was like assembling a mind bending puzzle! All that's nothing compared to the amount of time spent organizing & cutting clips. Taking 20 hours of footage & squeezing it into 4 minutes & 30 seconds is an achievement in itself. The film's supposed to make people feel something. The goal was goosebumps. Excitement. Dopamine in the bloodstream. The intro's meant to keep the viewer mildly interested while the music builds to the beat kicking at :58. That's the point at which I wanted them to be drawn in, and if they weren't, the introduction of real audio at 1:57 was meant to hook them. The tracking text on the animals was a set-up for a joke, the punchline for which is at 3:48. I wanted the cuts to be quick so viewer's left with a feeling that they missed so much they have to go back & watch it again, thus making the piece a little more interactive... and making the viewer feel a little more involved. Inspiration: The title alone was inspired by Marc Webb's mind-bogglingly creative (500) Days of Summer (Written by Neustadter/Weber). Though the title was a bite, the content in (270) was unrelated. The use of real audio was inspired, in part, by Romain Gavras's Adidas, All In video, which gets me amped every time I watch it! (270) blew up & went viral three days after I posted it on Vimeo. It's gotten a bit of press, being featured as a Curator's Choice on storyful.com and being featured on a nationally syndicated television show called Right This Minute (which I never even got to see). It's all very flattering, really, googling the title & seeing write-ups on hundreds of websites, in so many languages. It's nice to know that my work can transcend borders & cultures, and inspire & touch all of humanity... and for that I'm grateful. Back in November I was contacted by John of BLEACH, telling me about an opportunity to help with a shoot for Arbor. Arbor was putting on a show displaying the work of artists Blaine Fontana & Zach Johnsen, who do a lot of the work on Arbor snowboards & skate/longboards. So, producer Joel hired myself & my buddy Travis to document the event on camera & a week later, this is what Joel was able to put together to promote the exhibit. 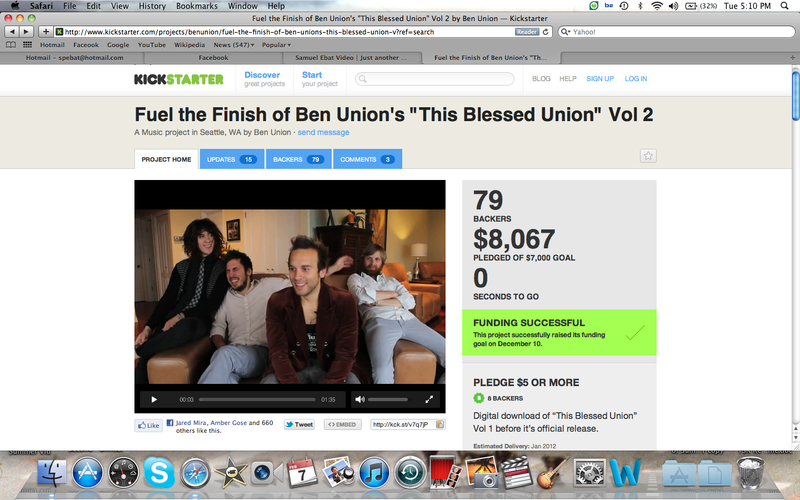 Turns out, this Kickstarter campaign ended up being pretty successful! They met their goal & then some. They were able to finish a rad album (which is now available on iTunes) & just recently had an epic album release concert. Things are looking up for the Union & if you haven't checked 'em out, you should!